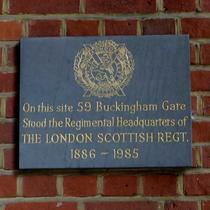 On this site, 59 Buckingham Gate, stood the regimental headquarters of the London Scottish Regt., 1886-1985. 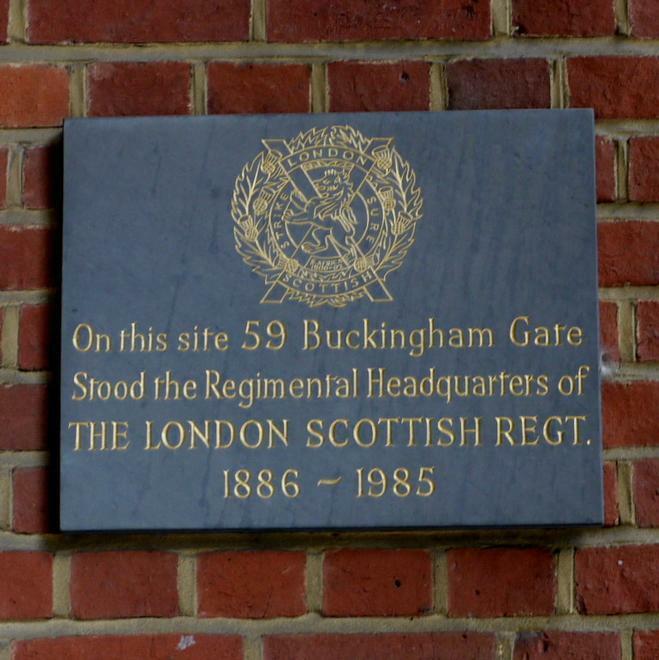 Disappointingly we have failed to find a photo of the building that used to be on this site. Swire is an international shipping company and 'Taikoo' is its Chinese name. We'd never heard of the company and then, just a few days after working on this entry, a character in a film we were watching explained his past presence in China by "I was working for Swire", and we knew what he meant. 2017: someone who tried to view these memorials has told us that he was told they are not here and never were. We took our photos in 2015 so they were in situ then. 2019: Andrew Behan has researched some of the names on this memorial. While doing so he spotted a discrepancy concerning the S.S. Shuntien: 'The Roll of Honour of the Merchant Navy and Fishing Fleets 1939-1947' held at The National Archives, Kew lists a total of 71 officers and men who died when that ship sank. But the data we received from the CWGC gives, on panel 97, a total of only 48 officers and men lost from that ship. The sad story of the SS Shuntien is told on Brynberg's page. When the ship went down it was carrying a large number of prisoners of war. This is reminiscent of the sinking of the Arandora Star which was deporting a many Italians and Germans who had been living in England.